Paul Lehner grew up in a coal-mining family and likely was headed for a life in the mines, but a talent for baseball brought him to the big leagues and gave him the opportunity to play for five different teams over the course of seven seasons. He was a left-handed outfielder and occasional first baseman whose relatively small stature (5-foot-9 and 160 pounds) led to the nickname "Peanuts." Lehner's father, George, came to the United States from Germany in 1900 and became a naturalized citizen in 1916. George married Alabama native Eva Eula Leslie and they raised four boys – George, Collis, John, and Paul, the youngest. Paul was born in Dolomite, Alabama, on July 1, 1920. Paul’s father worked as a coal miner, and died very young – at age 42 in 1925, a few months after Paul turned 5. Brother George had already begun work as an office boy for a local coal and iron company by the time of the 1930 census. Brother Collis became a professional ballplayer in 1938, pitching for the Greenville (South Carolina) Spinners, and worked on and off in pro ball until 1951. Scout Jack Fournier of the St. Louis Browns saw him at Kelly Field and signed him to a contract, to take effect on his discharge. Lehner spent the last year of his service time on Guam, but returned back Stateside and let it be known he was ready to do his best. 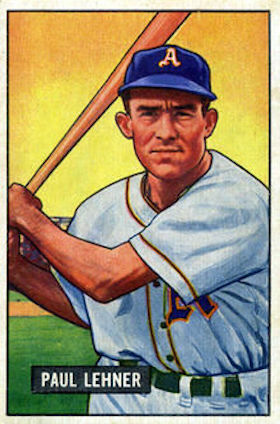 Coming off the 1945 season, in which they placed third (down from first place in 1944), Browns GM Bill DeWitt said he anticipated a "young, speedy, hustling team" in 1946.4 He added, "We will build our team around such speedsters as third baseman Bob Dillinger and outfielders Paul Lehner and Al Zarilla." Lehner was discharged two days before Christmas, 1945. Lehner was placed in Triple A with the Toledo Mud Hens (American Association) and had a very good year, batting for a .317 average in 144 games, playing the outfield. He hit 10 homers and drove in 75 runs. It was the only year he played minor-league ball, until his very last year of professional ball, 1952. Lehner was called up to the Browns in September. His debut, playing center field, came on September 10 at Sportsman's Park, St. Louis. He was 0-for-3 at the plate, but drew a base on balls and scored his first major-league run as the Browns beat the visiting Philadelphia Athletics, 5-1. The very next day, he got his first base hit – a single – and drove in his first run. He hit for a .248 average (slightly better than the team's .241) and drove in 48 runs (fourth on the Browns), with seven homers. His first RBI of the year was a pinch-hit bases-loaded 10th-inning single that won the Opening Day game against visiting Detroit. Lehner's first home run came at Fenway Park, a three-run drive on May 16. It wasn't a good year for the Browns, however; the team finished in eighth place, last in the league. Lehner's .980 fielding percentage pretty much matched his career .981 mark. (On June 25, 1950, Lehner tied an American League record by making 11 outfield putouts in one game.) After the season, he joined Bob Feller's barnstorming ball team to play in Texas, Mexico, and California. Trade rumors abounded immediately after the season, but the Browns kept Lehner on throughout both the 1948 and 1949 campaigns. In March 1948, he disappeared again – turning up in Las Vegas where he married Patricia Wolfe of San Bernardino.12 The very next week, he suffered a fractured shoulder blade and didn't play again until May 23. The Athletics, who had finished fifth in 1949, sank to last place in 1950, behind the Browns. Lehner, however, had done his part – from his first at-bat, a pinch-hit home run in the bottom of the 15th inning on April 22. He and Dillinger tied for the team lead in batting, each batting .309. (Dillinger was waived to Pittsburgh on July 20.) Lehner's .309 was a career high for him, as were the 52 RBIs and nine home runs he contributed. On December 27, 1950, Lehner and his wife, Pat, were living in Glendale, California, and welcomed Paul Jr. into the family. He played in only nine games for the A's in 1951 before he was dealt to the Chicago White Sox on April 30. It was a complicated three-team trade, also involving the Cleveland Indians.17 As it worked out, he played for four different teams in 1951. With the A's, in those nine games, he had hit .143 with one run batted in. With the White Sox, he played in 23 games, drove in three runs, and batted .208. On June 4, the White Sox traded him to the Browns (with maybe $50,000 in cash and Kermit Wahl) for Don Lenhardt. He hit .134 in 21 games when back in the Browns' uniform. He added two more RBIs to his 1951 total. The Browns placed him on waivers and the Indians selected him on July 19. He played in 12 more games, all but one in pinch-hitting and pinch-running roles, adding yet another run batted in. All in all, he had played for half of the teams in the American League in the same year, but only driven in seven runs in total. His combined batting average was .172 in 65 games. On March 29, 1952, the Indians optioned him to Indianapolis. On May 16, he was optioned to Oakland. On June 24, the Toronto Maple Leafs purchased his contract on a 30-day trial. And the very next day, he was recalled to Cleveland from Toronto and sold to the Boston Red Sox, who had selected him off waivers. It's a little difficult to follow the thread of the transactions in 1952, but the record shows him playing 12 games for Oakland, 8 for Seattle, 27 for Toronto, and 22 for Indianapolis. When he joined the Red Sox, Charley Maxwell was sent down to Louisville to make room for him on Boston's roster. Lehner joined Billy Goodman as the only other left-handed hitter on the Red Sox. He pinch-hit in the June 27 game, singling and driving in a run in the bottom of the seventh. He played the next day, also against Washington, and drove in another run. On June 30, he appeared as a late-inning defensive replacement in right field, but without a plate appearance. They were his final three games. On July 1 he was purchased again by Toronto. In March 1953, Lehner signed with the Memphis Chicks. He played in 56 games before being released in July. He batted .262 with 17 RBIs. They were his last games in organized baseball. We don't know for sure what form of work he may have pursued in his years after baseball. On his player questionnaire, marked "1965," he wrote on the line "Current occupation," "U.S. Marine Corps" and provided the address 2458 Carlton, San Bernardino, California, which is in 2016 very much a settled residential area. It was probably his home address at the time. Lehner died after a long battle with malignant lymphoma at Veterans Hospital in Birmingham, two days after Christmas, on December 27, 1967. He is buried in nearby Bessemer. Like his father, he had died in his 40s; Paul was only 47 years old. His brother, John, had died at age 31 in an automobile accident, but their mother Eva had lived to age 78. In addition to the sources noted in this biography, the author also accessed Lehner's player file and player questionnaire from the National Baseball Hall of Fame, the Encyclopedia of Minor League Baseball, Retrosheet.org, Baseball-Reference.com, Rod Nelson of SABR’s Scouts Committee, and the SABR Minor Leagues Database, accessed online at Baseball-Reference.com. 1 Frederick G. Lieb, "Brownies' Leaping Lehner Hits Big Time in Jig Time," The Sporting News, May 28, 1947: 11. 3 Ibid. His status as a washout was self-reported. See Jack Cuddy, United Press, "Take It From Those Browns, Lehner Is No Washout," Register-Republic (Rockford, Illinois), August 5, 1947: 13. 4 Joe Reichler, "Browns Dangle Heath and Early As Trading Bait," Sacramento Bee, December 1, 1945: 24. 5 L. A.McMaster, "Paul Lehner," The Sporting News, April 9, 1947: 3. 6 "Truancy Brings Lehner $200 Fine, Suspension," The Sporting News, August 13, 1947: 9. 7 Oscar K. Ruhl, "Leaps Kept Browns Looking for Lehner," The Sporting News, November 26, 1947: 5. 8 Art Morrow, "'Barefoot Boy' Lehner Gets Firm Toehold in A's Outfield," The Sporting News, May 24, 1950: 9. 9 Burt Whitman, "Sox Shut Out Browns, 2-0," Boston Herald, July 20, 1947: 64. 10 ANP, "Browns Player Changes Mind About Quitting," Los Angeles Sentinel, July 31, 1947: 22. 12 There may be some confusion regarding his marriage. The Associated Press ran the story datelined March 30, 1948 that he had married Miss Wolfe "last night" in Las Vegas. On his player questionnaire, which Lehner himself completed for the Hall of Fame, he wrote that he had married Maurene Estelle Stidham on March 20, 1948. The spelling of Maurene is the way he rendered it. 13 Ford Sawyer, "Majors' Pinch-Swingers Led by Lehner With .545," The Sporting News, February 2, 1949: 18. 14 United Press, "Browns Place all Players Over 28 on Trading Bloc," Boston Globe, October 28, 1949: 29. 15 Ken Opstein, INS, "Brownie Deals Look Good in Bank Balance if Not on Field," Register-Republic, December 16, 1949: 37. 16 United Press, "'Extra Baggage' Lehner Proves Bargain for A's," Hartford Courant, April 27, 1950: 18. 17 The Chicago White Sox sent Dave Philley and Gus Zernial to the Philadelphia Athletics. The Philadelphia Athletics sent Lou Brissie to the Cleveland Indians. The Cleveland Indians sent Minnie Minoso to the Chicago White Sox. The Cleveland Indians sent Ray Murray and Sam Zoldak to the Philadelphia Athletics. 18 "Lehner Misses Early Drill: 'I Couldn't Find the Park'," The Sporting News, March 5, 1952: 35.